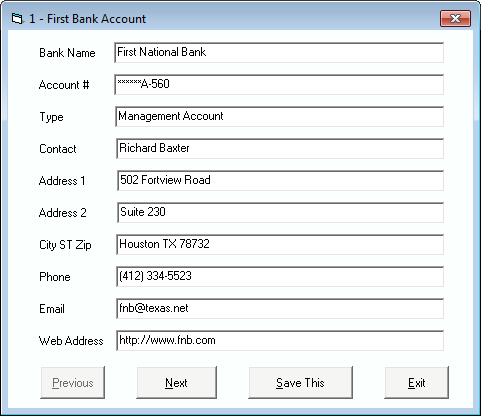 The Tenant File handles up to 10 bank accounts. Typically they are used for operating accounts, security deposit accounts, trust accounts, or private owner bank accounts. Each one comes with separate reconciliation features. The typical way that property managers handle their bank accounts centers around a primary property management operating account. This is the account where all of the rent income is posted, and where checks are written from. The checks would typically include checks to vendors for repairs and maintenance, owner payments, mortgage payments, and other expense items. The Tenant File has many time saving operations, and most of them default to the primary bank account, such as creating deposits for rents received or paying out owner funds. We realize that one bank account is not always enough. Many managers do not want to mix their Security Deposit money with their Property Management Bank Account, and some states are required by law to have a separate account for the tenant security deposits. Other managers might have a separate 'trust account' where their income needs to be deposited. The Tenant File supports up to 9 extra bank accounts exactly for this purpose. All bank accounts have the ability to create deposits, checks, post bank charges and credits, and to reconcile to bank statements. Reports can be printed for any of the ten bank accounts. Note: Additionally, if you want to completely separate out a property such as an apartment complex, you can simply install the Tenant File into a separate folder for that. There is no extra cost involved. For example, you manage a number of single family homes, and you also manage a large apartment building. In this case, you might want to install the Tenant File once on your computer for the single family homes and also create a separate installation for the apartment complex. This is easy to do in the Tenant File simply by installing the program twice, in two different folders on your computer. You will end up with a separate icon for each installation, and 'each' installation with have the ten bank accounts.